Over the last decade the city of Detroit has been negatively impacted by the role of the financial institutions which engineered the theft of tens of thousands of homes, jobs and small businesses straight across the largest per capita African American populated major municipality in the United States. Once a working class city with neighborhoods filled with single-family, two-family and multiple-residents housing, Detroit stood out among most other large metropolitan areas in the country. 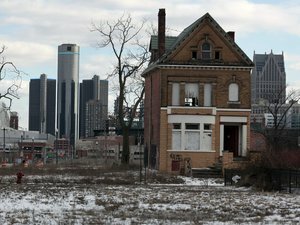 The housing crisis in Detroit is inextricably linked to the restructuring of the industrial and commercial base of the U.S. Beginning in the mid-1950s, and extending through the first decade of the 21st century, the theft of millions of jobs around the U.S. particularly had a devastating impact on Detroit. With a declining population and tax base, the city was subjected to even more predatory activity by some of the largest financial institutions internationally. Nonetheless, people have fought back against these atrocities by the ruling capitalist class and its agents within the state. The Michigan Emergency Committee Against War & Injustice (MECAWI), founded in September 2002 amid the Pentagon build-up in the Persian Gulf region in preparation for the invasion and occupation of Iraq, had expanded its focus over the years to examine how the defense budget destroys the capacity of urban areas to provide housing, education, utility services and environmental quality. By the spring of 2008, a coalition of forces came together with MECAWI to form the Moratorium NOW! Coalition to Stop Foreclosures, Evictions and Utility Shut-offs. The impetus for the formation of this alliance was the willingness of former Democratic State Senator Hansen Clarke of Detroit to submit a bill within the state legislature which would have mandated a two-year moratorium on foreclosures and evictions. This bill met with immediate opposition from varied elements among both the Republican and Democratic Parties failing to even get out of the finance committee. The-then Governor Jenifer Granholm (Democrat) rejected the idea saying that it was not necessary or that the banks would not like it. She expressed fear that they would be in court the following day even though Granholm was the former Attorney General of Michigan. Granholm in 2009 imposed emergency management over the Detroit Public Schools resulting in the closing of over 100 buildings and the decimation of the district, the largest in Michigan. Earlier Granholm had appointed an emergency manager over the predominantly African American city of Benton Harbor on Lake Michigan. The city had been subjected to racist disinvestment leaving thousands unemployed and impoverished. Granholm, after the Benton Harbor rebellion of June 2003, rather than provide real assistance to Benton Harbor to create jobs, housing and economic opportunities, instead endorsed the privatization of Lake Michigan’s Jean Klock Park, a public entity, leading to the Harbor Shores Development scheme which ended up gentrifying the waterfront area and constructing a golf course for the rich and powerful. The latest phase of the housing struggle in Detroit opened up in mid-July when the Michigan American Civil Liberties Union (ACLU) along with the NAACP Legal Defense Fund and Covington & Burling LLP, a private law firm, filed a class-action lawsuit to impose a moratorium on property tax foreclosures within Wayne County. The suit contends that the majority African American city of Detroit has been disproportionately affected due to overinflated tax rates stemming from the failure of the municipal government to conduct proper assessments of the values of properties and to grant poverty exemptions from property taxes for those who qualify. Statistics cited in the Michigan ACLU complaint indicates that “owner-occupied homes in 100 percent African American Census blocks are more than 13 times more likely to be at risk of a tax foreclosure sale than 100 percent non-African American Census blocks.” Such stark disparities are clearly racist in their nature and character. Detroit has the highest concentration of poverty among any other major city in the U.S. as spelled out in a recent study by the Brookings Institution. Even without access to this data compiled and analyzed by this research center and think tank, all one needs to do is drive around the city to see the devastation brought about by corporate policies led by the banks through predatory lending and racially-oriented red lining. No one really knows what is meant by “worker-owned cooperatives” mentioned in the report with the city having one of the highest jobless rates in the country. Nevertheless, the role of misguided and deceptive so-called “development policies” are doing nothing for the majority African American population accept driving them further into poverty and destitution. During the period between 1957 and 1968, four significant Civil Rights bills were passed by the U.S. Congress: the Civil Rights Act of 1957 on voting; the Civil Rights Act of 1964 outlawing discrimination; the Voting Rights Act of 1965 ostensibly guaranteeing universal suffrage; and the Fair Housing Act of 1968. Since this time period the overall status of the Civil Rights of African Americans have been in precipitous decline with rising poverty, mass unemployment and poverty along with attacks on the right to vote through the gutting of the enforcement provisions of the Voting Rights Act and the failure to enforce the Fair Housing Act where the government allowed African Americans to be systematically expropriated of their only real wealth embodied in homeownership. This class-action lawsuit provides further material evidence of the collusion of the banks and their political collaborators in undermining the right to housing and a decent quality of life for African Americans. The mass struggle which fought for people’s homes and their right to remain within the city and Wayne County must continue because it is the pressure from the bottom up that will transform the U.S. from a country dominated by a small section of the ruling class to one controlled by the masses of working families and the nationally oppressed.